With no fewer that NINE awards for gallantry, these two fighter pilots are among the most decorated of the war. Stanford-Tuck took part in all the air fighting over Dunkirk, the large air battles over the Channel, and throughout the Battle of Britain. An exceptional pilot, aggressive, and whether leading a flight, squadron, or wing, did so with great courage and panache. Stanford-Tuck flew his first aerial combat over Northern France in May 1940 with 92 Squadron, destroying an Me109 in the morning, and two Me 110’s in the afternoon. By the end of the Battle of Britain he was a legend. With 92 Sqn Don Kingaby flew Spitfires in the Battle of Britain and by November 1940 had shot down 9 enemy aircraft. He became one of WWII’s most successful and highly decorated RAF fighter aces with a final score of 23 credited victories, eight ‘probables’ and 16 damaged. 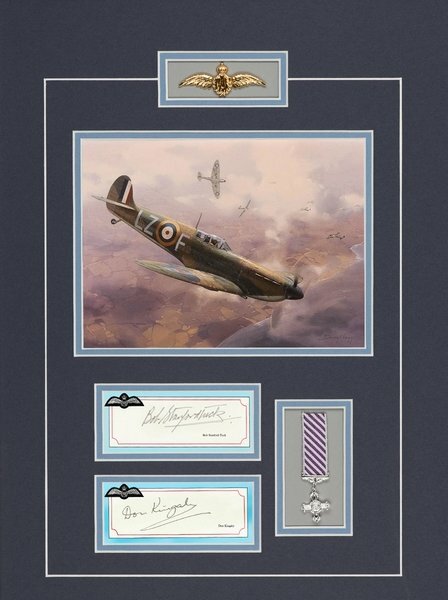 He was the first and only RAF fighter pilot to be awarded three DFM medals for gallantry.